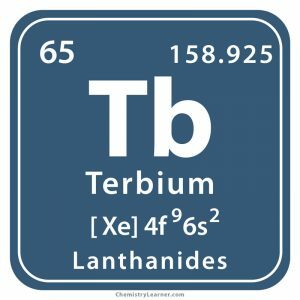 Terbium (pronunciation: TER-bee-em) is a soft, silvery rare earth metal belonging to the Lanthanide series of elements represented by the symbol Tb [1, 2]. 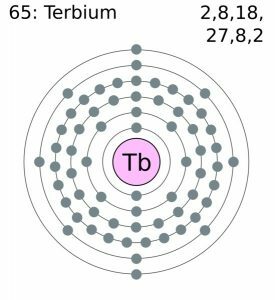 While the naturally occurring terbium contains one stable isotope, terbium-159, it has 36 radioactive isotopes out of which the most stable one is terbium-158 with a half-life of 180 years . Being one of the rarest elements in the lanthanides group, it does not occur in a free state in nature . However, it can be obtained from the minerals bastnaesite and monazite through solvent extraction and ion exchange . 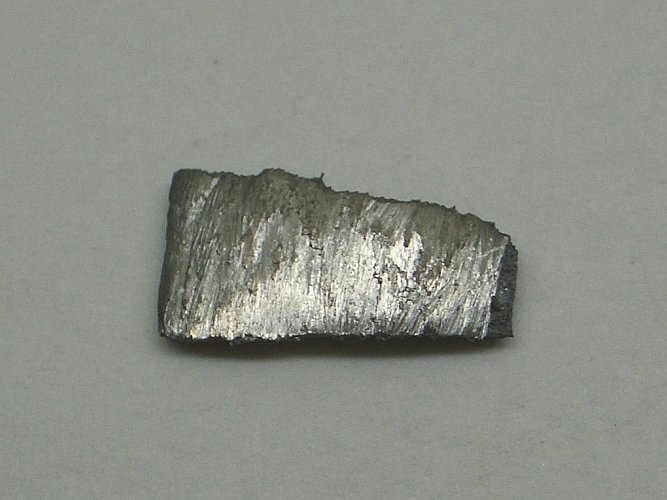 The complex oxide named euxenite also consists of at least 1% terbium . 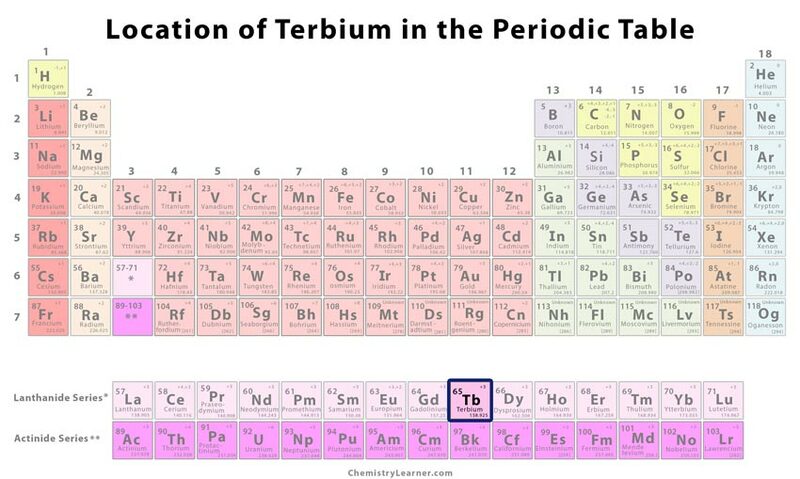 The top 3 terbium producing countries are China, Russia, and Malaysia, while the top 3 terbium reserve-holding countries include China, Russia, and the USA . Origin of its Name: It is named after the Ytterby mines in Sweden where the mineral gadolinite (the source of terbium) was discovered [1, 5]. Who discovered it: The Swedish chemist Carl Gustaf Mosander is considered to be its discoverer . In 1843, the mineral gadolinite was separated by Carl Gustaf Mosander to produce three substances that were named terbia, erbia, and yttria . By 1877, scientists had reversed the names of terbia and erbia because they had confused the two substances due to the similarities between their properties and names . From these two materials, Mosander discovered the rare earth elements erbium and terbium [5, 6]. Later, the French chemist George Urbain performed thousands of fractional crystallization for separating rare earth elements, and obtained terbium’s spectrum . As a dopant, terbium is added to improve the properties of chemical compounds like strontium molybdate, calcium tungstate, and calcium fluoride that are generally used in solid-state devices . Because of its luminescence, the element is used in lighting applications including color TV tubes, mercury lamps, trichromatic lighting, and low-energy lightbulbs [1, 6]. For determining counterfeit money, Euro banknotes have terbium, europium, and thulium. When UV light falls on the currency note, green, red, and blue fluorescence are seen due to the presence of Tb3+, Eu3+, and Tm3+ respectively . It helps in producing quality medical x-ray images with a short exposure time, thereby improving the safety of the procedure . An alloy of iron, dysprosium, and terbium (Terfenol-D) lengthens or shortens in the presence of a magnetic field. The magnetostriction property of the element is used in creating loudspeakers that when placed on a flat surface like a desk or table, which in turn acts as a speaker [1, 6]. 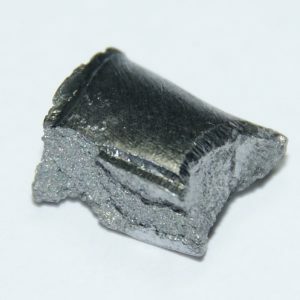 Terbium is added to dysprosium and neodymium to produce an alloy used in magnets that are found in hybrid car engines . Terbium salts like terbium acetate are used in special laser devices . 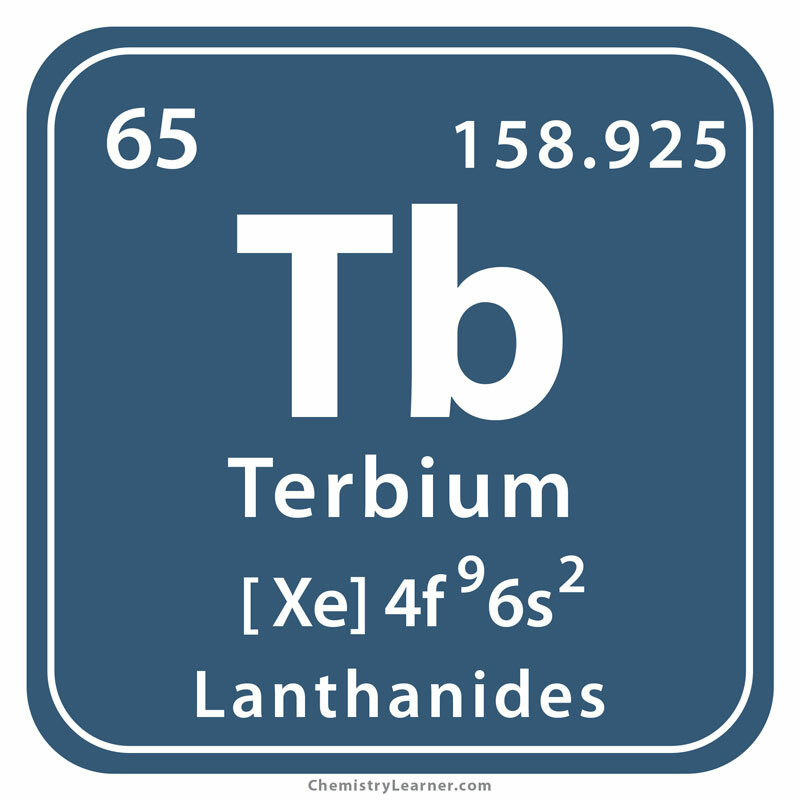 Because of its low toxicity, terbium does not have any known health effects and hazards . Since terbium was used to manufacture the first rewritable CD, the element has been represented by the compact disc symbol . It is commercially produced by reducing anhydrous chloride or fluoride with calcium metal through vacuum distillation . Compounds like terbium sulfate are used for anti-counterfeiting markers . The pure form of terbium generally costs around $1800-$5,040 per 100 grams [6, 10].